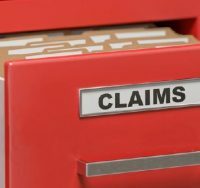 Claims against litigators are the largest area-of-law subset in LAWPRO’s claims portfolio. The rate of increase in claims in this area outstrips all others, and is an increasing source of concern.In the past two years, we have focused on the claims impact of the changes to Rule 48 of the Rules of Civil Procedure. Judgments reported in 2017 include actions dismissed as statute barred, administrative dismissals by registrars, dismissals for failing to “show cause” at status hearings, dismissals under Rule 24, and decisions refusing to restore actions to the trial list. However, claims against litigators are far more varied than these, as these summaries of some LAWPRO cases reveal. Usually, where plaintiff’s counsel fails to sue all proper and necessary parties, no damages arise from this error, because the defendants who were sued have the assets to pay any judgment. Such was not the case in an action alleging construction and design defects (2017 ONCA 115). The defendants whom the solicitor did sue – the developer and the contractor – were insolvent. The solicitor negligently believed that the engineer owed no duty to the plaintiffs, so did not sue him. Unfortunately for the solicitor, the engineer was both liable and solvent. The solicitor was held liable for 100 per cent of the money which the plaintiffs would have recovered from the engineer, had he been sued. In a dispute between a subcontractor and contractor (2017 ONSC 4417), the solicitor for the subcontractor negligently failed to advise his client to commence an action against the contractor’s director under s. 13 of the Construction Lien Act. The Court accepted that the subcontractor would have been legally entitled to judgment against the director personally for $102,932.22 plus interest, plus costs. The director had assets of about $97,000 to satisfy such a judgment, at the time the action should have been commenced. However, when the costs of litigation were taken into account, as well as the difficulties in enforcing the judgment against the director’s assets, the subcontractor would have recovered about $50,000, which was just over 50 per cent of the director’s stated assets. The client received judgment against the solicitor for that amount. A commercial dispute between relatives led to litigation. After one of the parties fired his original counsel and hired another, a settlement was ultimately reached. In the wake of the settlement, the party who had changed counsel sued the law firm that had first represented him (2017 ONSC 2423. Not on CanLII; under appeal). The firm moved for summary dismissal of the negligence action. Woollcombe, J. found that there was no evidence that the firm fell below the standard of reasonably competent counsel. Furthermore, even if the Court was wrong about the negligence issue, the plaintiff in the negligence action failed to demonstrate that there was a genuine issue for trial on the issue of damages caused by the firm’s alleged negligence. The plaintiff did not reveal the terms of the actual settlement, nor did he describe the settlement he expected to receive had it not been for the firm’s alleged negligence. Another law firm obtained, by summary judgment, an order for payment of its legal fees in the amount of $182,569.63 and an order dismissing a former client’s counterclaim alleging negligence against it (2017 ONSC 3391, under appeal). Crucial to the dismissal of the negligence claim were findings that the claimants were sophisticated businessmen who understood the expense and risk of litigation, and had sufficient personal knowledge to appreciate the quantum of damages they could reasonably expect to recover. They failed to satisfy the Court that but for the firm’s failure to properly advise them, they would have discontinued the litigation, and would instead have used the funds spent in litigation to expand their business. A law firm represented a lawyer with respect to the lawyer’s unsuccessful defence of an action to enforce a foreign judgment. The law firm was not paid, and when it sued for payment, the lawyer counterclaimed, alleging negligent defence of the action, and failure to advise the lawyer to sue LAWPRO (2017 ONSC 1917). D.L. Corbett, J. summarily dismissed the lawyer’s counterclaim. In doing so, Corbett, J. found the law firm was not negligent in its unsuccessful effort to defeat the enforcement in Ontario of the foreign judgment, nor was it negligent in failing to advise the lawyer to immediately sue LAWPRO, once the enforcement action was commenced in Ontario. An action against LAWPRO had no chance of success. The lawyer’s counterclaim against the law firm was also an abuse of process, in that it attacked findings of the trial court and of the Court of Appeal in the enforcement action. According to a judgment of the Divisional Court (2017 ONSC 5566 (Div.Ct. )), a civil litigator defending a sexual assault claim did not breach the implied undertaking rule by providing the plaintiff’s discovery evidence to his client’s criminal lawyer for impeachment purposes. Rule 30.1.01(6) expressly allows the use of discovery evidence in other proceedings, for the purpose of impeachment. No judicial preclearance is required. In the wake of litigation over harm sustained via a traffic accident, the plaintiffs hired a new lawyer to assist them in an assessment of the fees charged by the first lawyer. They later brought a negligence action against the second lawyer, alleging that he had not competently advised them with respect to their claims against the first lawyer. The second lawyer brought a successful motion to have those claims dismissed. The plaintiffs appealed (2017 ONCA 103), this time restricting their arguments to the issue of whether the second lawyer had owed them a duty of care to advise of the limitation period as it applied to the potential negligence action against the first lawyer. In deciding the case, the Court of Appeal considered a lawyer’s duty to give advice outside of his written retainer. The Court of Appeal held that Warkentin, J., in granting summary judgment to the second lawyer, erred in failing to consider whether he had owed the plaintiffs a duty to advise them about the limitation period for suing the first lawyer, even though the written retainer between the plaintiffs and the second lawyer was restricted to an assessment of the first lawyer’s account. The Court of Appeal held that in certain instances, a solicitor’s duty may extend beyond the four corners of the written retainer. A careful examination of the facts is required. Warkentin, J. had noted that the evidence supported the likelihood that the second lawyer informed the plaintiffs of the limitation period. However, she did not find it necessary to make an actual finding on this point, since such advice fell outside the scope of the written retainer. In allowing the appeal and sending the negligence issue to trial, the Court of Appeal held that it would have been helpful had Warkentin, J. made a finding on this point. The Limitations Act, 2002 is an on-going hazard for litigators. Even when limitation defences are defeated, doing so is costly. In a suit over contaminated real estate (2017 ONCA 16), the Court of Appeal allowed an appeal from the order of Kelly Wright, J., who dismissed the plaintiff’s action as statute barred. The plaintiff had alleged that the defendant was responsible for the contamination of the property which it had recently purchased. Mere suspicion that the property might be contaminated did not start the limitation period running. In all of the circumstances, the plaintiff/ appellant exercised appropriate diligence in discovering the contamination claim. A negligence action against a lawyer (2017 ONSC 4292, under appeal) was based on the lawyer’s work on three different matters on behalf of the plaintiff. The plaintiff had commenced all three matters prior to retaining the lawyer. Monahan, J. summarily dismissed the action. Of especial interest is the judgment’s treatment of a solicitor’s liability, where the underlying action the solicitor was prosecuting became uncollectible, allegedly because of the solicitor’s delay in prosecuting the action, during which time the defendant became insolvent. To the extent that there was delay in moving the matter forward, the record tended to indicate that this was attributable to the plaintiff’s failure to provide a retainer and/or timely instructions. The plaintiff provided no evidence with respect to the judgment debtor’s alleged bankruptcy, nor did he explain how proceeding more expeditiously would have enabled him to enforce his judgment. Accordingly, even if the lawyer had negligently failed to proceed expeditiously, the plaintiff failed to prove that this delay caused him loss. Throughout 2016, LAWPRO warned the profession against an anticipated “tidal wave” of administrative dismissals under Rule 48.14, beginning in early January, 2017. Rule 48.14 provides that actions commenced before January 1, 2012 would be administratively dismissed, if they were not set down for trial by January 1, 2017, or if a timetable was not established, or an application for a status hearing to “show cause” was not launched. In the second half of 2016, many “show cause” status hearings were requested in order that plaintiffs could avoid the automatic dismissal of their actions by the registrar on January 1, 2017. Many of these motions were argued in 2017. The numerous “show cause” motions, or timetables set on consent, may explain why there were fewer administrative dismissals in January, 2017, than we had feared. At a status hearing which took place on March 23, 2017 (2017 ONSC 3387), Master Graham concluded that the plaintiffs had successfully shown cause, and that the action should proceed. The statement of claim was issued on June 7, 2011. In December, 2016, the plaintiffs brought a motion for a status hearing under Rule 48.14(5), in order to show cause why the action should not be dismissed for delay, and for an order establishing a timetable for the completion of further steps in the action. As of March 23, 2017, the day the plaintiffs’ motion was argued, the action had not yet been set down for trial. Nevertheless, the action was allowed to continue. The litigation delay was explained by good faith settlement discussions. The defendant itself did little to advance the action. At a January 2017 status hearing (2017 ONSC 3784), Master Pope declined to dismiss the plaintiff’s action notwithstanding that the action was commenced in September, 2008. The motion for a status hearing and an order establishing a timetable for the completion of the remaining steps in this action, and for an order extending the time to set the action down for trial, was launched in November, 2016, to avoid dismissal of the action by the Registrar on January 1, 2017. Once again, the defendants were not prejudiced, and they did little to move the action along. was a personal injury action (2017 ONSC 5662), although it also involved breach of a set down order. The accident occurred in February, 2011. The action was commenced in November, 2011. It proceeded through pleadings and discoveries. Master Graham ordered that the action be set down for trial by December 31, 2014. The plaintiff did not do so. The action was dismissed on January 6, 2015. The parties continued to advance the action, as if there were no dismissal order. Plaintiff retained new counsel in 2016, at which time steps were taken to set aside the dismissal. Master Muir applied the traditional test for setting aside administrative dismissals. The plaintiff had always intended to proceed with the action, and much had been done to move the action forward. The explanation for the delay was adequate, although not perfect. The set down date was missed through inadvertence. Plaintiff’s lawyer failed to properly diarize the set-down date. The motion to set aside the dismissal was NOT brought promptly. The plaintiff did rebut any presumption of prejudice. The defendants presented no evidence of actual prejudice. The plaintiff satisfied three of the four relevant factors, including the key consideration of prejudice. For the most part, the courts should focus on the rights of the parties, rather than the conduct of counsel. Master Muir ordered that the dismissal order be set aside. However, he also ordered the pre-judgment interest be suspended from the date of the dismissal order through the date of the argument of the motion. 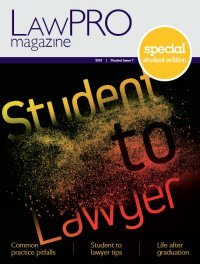 The foregoing sampling of cases which LAWPRO defended for the profession in 2017 illustrates the hazards of litigation practice. As you will no doubt appreciate, even successful defences are expensive, and we consider ourselves lucky to receive and collect partial indemnity costs, even where we are successful. Your insurance premiums at work! Debra Rolph is Research Director at LAWPRO.